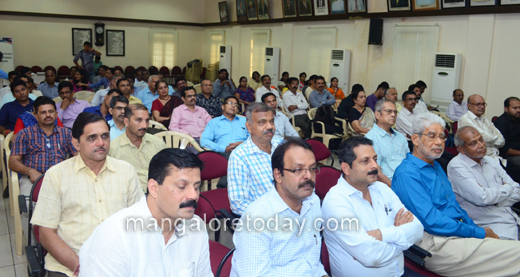 Mangaluru, Oct 27, 2017: Complaints poured in on civic issues ranging from no footpaths to supply of polluted drinking water were aired at an interactive meeting on Mangaluru city development with Mayor Kavita Sanil here on Oct 26, Thursday. The meet was organised by Kanara Chamber of Commerce and Industry (KCCI). A member of the public pointed out that residents on J.B. Lobo Road in Kodical have been getting reddish mud coloured drinking water since June this year. It is more than a month now since the monsoon ended. But the residents are not getting clean water. The Mayor immediately called a water supply engineer to attend to it. Another participant asked the Mayor to build footpaths at least between Lalbagh and KSRTC Bus Stand in Bejai to enable people, especially senior citizens, to walk freely. The roadside has been occupied by flower sellers. The MCC has built storm-water drains on many roads upgraded as concrete roads. But storm water does not flow into them. Instead, it stagnated on the road. What kind of engineering is it, he asked. A senior citizen drew the attention of the Mayor on the increasing uncontrolled roadside eateries in the city which may pose health hazard to people any time. He said that the road between Padil and Kankanady, which is the entry point to the city, selected under the smart city scheme, has been in bad condition for many months. It would leave a bad impression on tourists coming to the city. The participant pointed out to the lack of boards to give information to tourists on places to visit, and also street directions in the city. Replying to it, the Mayor said that a proposal has been prepared and it would be implemented. A businessman said that there was no proper system of responding to the complaints of people on civic issues in the corporation. He asked the corporation to take a cue from the Prime Minister’s Office which responds to the complaints filed by people by marking it to the departments and authorities concerned. If the PMO office could do it, why not the corporation office, he asked. He pointed out to a situation that has arisen where people have been forced to approach courts to get their grievances related to the MCC solved.